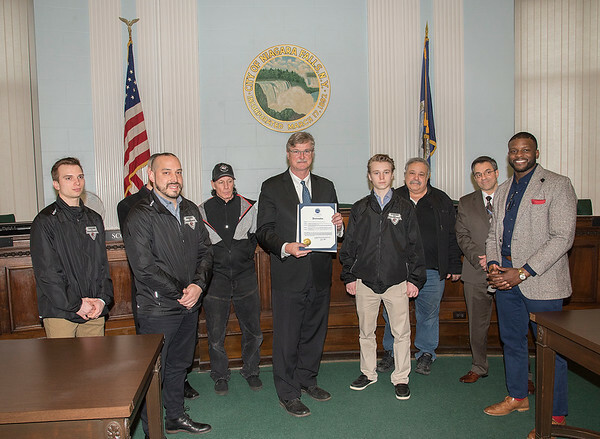 Niagara Falls, NY - Mayor Paul Dyster honored the Powerhawks hockey team with a proclamation for making the playoffs in the NA3HL Junior A Hockey League. On Monday, March 12 at 4:30 PM, Mayor Paul Dyster and members of the Niagara Falls City Council will gather in Council Chambers for a brief photo op to recognize the Niagara Falls Powerhawks. As you may know, the Powerhawks have made the playoffs for the NA3HL Junior A hockey league taking place March 16-18. They will host the first of those games at the Hyde Park Ice Arena next week. Attached you will find a release with contact and additional information on the team.